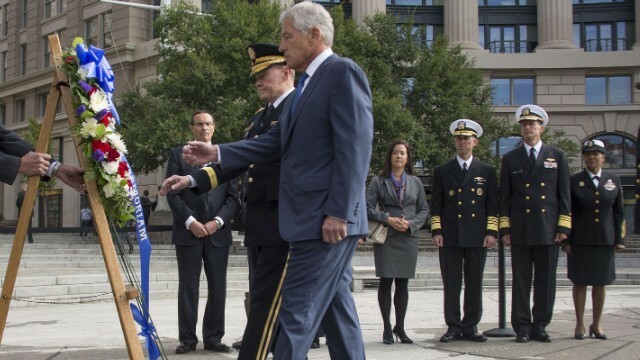 U.S. Defense Secretary Chuck Hagel and Chairman of the Joint Chiefs of Staff Gen. Martin Dempsey prepare to lay a wreath at the U.S. Navy Memorial plaza on Tuesday to honor the victims of Monday's Washington Navy Yard shootings. Live updates below. Also, read the full story and a profile of Alexis. [Updated 8:13 p.m. ET] Alexis entered Building 197 at Washington's Navy Yard with a small bag that is believed to contain a disassembled shotgun he used in the mass shooting, a federal law enforcement official says. Surveillance video shows Alexis ducking into a bathroom with the bag and leaving it with a shotgun, according to the source. Alexis had 00 buckshot shells, each of which are packed with a dozen pellets and are capable of causing tremendous damage, the same law enforcement official says. [Updated 8:08 p.m. ET] Alexis contacted two Veterans Affairs hospitals in and around Washington recently and got treated for sleep-related issues, a law enforcement source says. A second law enforcement source tells CNN that, as far as investigators know now, Alexis sought help for insomnia. But another source said Alexis asked for help because he was "having problems sleeping" and "hearing voices." [Updated 8:03 p.m. ET] Navy officers knew about an incident in which Alexis was arrested for shooting the tires of a car - in what he later told detectives was an anger-fueled "blackout" - but admitted him to the Navy and gave him secret security clearance in 2007 anyway, a senior Naval officer told CNN. [Updated 7:56 p.m. ET] The Experts, the contracting firm for which Alexis worked for about six months over the past year, said it performed two background checks on him and confirmed twice with the Defense Department that Alexis had a secret security clearance. "The latest background check and security clearance confirmation were in late June of 2013 and revealed no issues other than one minor traffic violation," the company says in a statement. [Updated 7:36 p.m. ET] Alexis paid $419 to buy a shotgun at Sharpshooters Small Arms Range, said the store's lawyer, J. Michael Slocum. Slocum also said that he made the purchase on Saturday afternoon - and not Sunday, as he had earlier told CNN. [Original post at 4:14 p.m. ET] Alexis bought a shotgun and about 24 shells on Sunday - the day before the shooting - from the Sharpshooters Small Arms Range in northern Virginia, the store's attorney, J. Michael Slocum, said. Before buying the Remington 870 shotgun and the ammunition, he used a store rifle at a practice range, and he was at the store for at least a couple hours, Slocum said. Video of Alexis at the store has been given to the FBI, according to Slocum. [Updated 7:27 p.m. ET] Aaron Alexis' dark blue rented Toyota Prius was towed Tuesday from the Washington hotel where he'd been staying, a law enforcement source says. [Updated 6:29 p.m. ET] Navy spokesman John Kirby says that authorities are looking to "see what red flags, if any, were missed" ahead of Aaron Alexis's mass shooting at Washington's Navy Yard. Alexis got security clearance in 2007, and it was still valid when he left the Navy in 2011, according to Kirby. [Updated 6:17 p.m. ET] Washington, D.C., police Officer Scott Williams shot and killed Aaron Alexis, ending the latter's rampage at the historic Navy Yard, Mayor Vincent Gray told CNN. Williams is in good spirits after undergoing surgery tied to his being shot in the leg, according to Gray. [Updated 6:12 p.m. ET] The Washington Navy Yard will be opened Wednesday to "essential" personnel only, says base spokesman Ed Zeigler. "Access to Building 197 is still prohibited," he added, referring to the building where the shooting occurred. [Updated 4:04 p.m. ET] Police in Newport, Rhode Island, say Alexis contacted them while he was staying there in August, complaining that he was hearing voices and was worried that three people were harassing him, according to CNN's Deborah Feyerick. Newport police say they contacted the Newport naval base in August about their encounter with Alexis, who was working there as an information-technology contractor. Alexis told Newport police that during a flight from Virginia to Rhode Island, he got into a “verbal altercation” with someone, Newport Police Lt. William Fitzgerald said. Fitzgerald says Alexis told police “he was a naval contractor who travels often.” He explained that during a flight from Virginia to Rhode Island, he got into a “verbal altercation” with an individual. Alexis told police he believed that the “individual had sent three people to follow him and to talk, keep him awake and send vibrations into his body," Fitzgerald said. According to a police report, Alexis said he first heard the people talking to him through a wall at a Middletown hotel where he was staying. He packed up and went to an unidentified hotel on the naval base where he heard the same voices talking to him, so he moved to a third hotel. Earlier Tuesday, a source with direct knowledge of the investigation told Feyerick that Alexis exhibited signs of mental problems in recent months and tried to get help at a Veterans Affairs facility in Rhode Island. [Updated 3:27 p.m. ET] Alexis bought a shotgun from Sharpshooters Small Arms Range in the last few weeks, an attorney for the store said, according to CNN's Chris Lawrence. The attorney, J. Michael Slocum, said Alexis had a valid driver's license, and the gun shop "did the full required background check, the same that's done when someone buys a weapon of any sort." Slocum indicated there was nothing in the background check to stop the sale to Alexis. Slocum also said the FBI visited the store once since Monday's shooting, and that the store is cooperating with the investigation. The FBI has said the Alexis used a shotgun in the shooting. [Updated 2:28 p.m. ET] The news conference is over. Some more highlights from D.C. Police Chief Cathy Lanier: She said that within seven minutes of the first emergency call, police had at least two units inside the building where the shooting was happening. The first unit arrived at the yard itself within two minutes of the call. It took police a while to determine which building was the shooting site, because callers were giving different building numbers, she said. Security personnel from several agencies had "multiple engagements" with Alexis before the final shots were fired, she said. [Updated 2:23 p.m. ET] More from the news conference: D.C. Police Chief Cathy Lanier elaborated on why she thinks the officer who was shot in both legs will make a full recovery, when there had been questions Monday of whether he would walk again. "We have a very good prognosis from the doctors," Lanier said. She said that because of his personality, she believes that he will eventually be "outrunning all of us." [Updated 2:15 p.m. ET] More from the news conference: The Washington police officer who was shot in both legs Monday is doing well, D.C. Police Chief Cathy Lanier said. He had surgery Monday. “We expect he will make a full recovery,” Lanier said. Earlier, CNN's Chris Lawrence reported that physicians were expected to begin determining Tuesday whether the officer would be able to keep the limbs. Also, Lanier said at the news conference that there's "no doubt in my mind" that the officers responding to the shooting "saved numerous lives." [Updated 2:11 p.m. ET] More from the news conference: Alexis arrived in the Washington area on or about August 25, staying in hotels, said Valerie Parlave, assistant director in charge of the Washington FBI field office. He most recently stayed at a Residence Inn in southwestern Washington, D.C., beginning around September 7, she said. Anyone who contacted him during that time should contact the FBI, she said. [Updated 2:08 p.m. ET] FBI and other officials have begun a news conference in Washington, updating reporters on the investigation. Alexis entered the yard's building 197 - where the shooting took place - with a shotgun, and investigators believe he obtained a handgun inside the building after he started shooting, Valerie Parlave, assistant director in charge of the Washington FBI field office, said moments ago at a news conference. This confirms what federal law enforcement sources said earlier. [Updated 2:01 p.m. ET] U.S. Defense Secretary Chuck Hagel is ordering a worldwide review of physical security measures at all U.S. military installations in the wake of Monday's shooting, a senior Pentagon official said Tuesday, according to CNN's Barbara Starr. Hagel will order the military to look at all existing security measures to see if they are sufficient and to determine what other measures may be needed, the official said. At the same time, the Pentagon is still trying to determine what it needs to do to begin a parallel review of security clearances and access standards for contractors and other employees, according to a Defense Department official. Some elements of clearance procedures are handled by other parts of the government so coordination will be required, but the official said it’s expected some review of that element will also take place. This follow an earlier confirmation from the Navy that it was beginning a similar physical security review at all of its installations. [Updated 1:13 p.m. ET] Alexis was “having problems sleeping” and was “hearing voices,” a source with direct knowledge of the investigation said, according to CNN's Deborah Feyerick. The source said Alexis exhibited signs of mental problems in recent months and tried to get help at a Veterans Affairs facility in Rhode Island. He had been working in Newport, Rhode Island, as an information-technology contractor in August. The source also said that the 9/11 attacks triggered Alexis to leave his home in New York City. Alexis could not deal with the attack, left New York and essentially became a wanderer going from place to place – San Diego, Texas, and overseas, the source said. His father told Seattle police in 2004 - after Alexis was arrested there - that his son was suffering from post-traumatic stress disorder after taking part in 9/11 rescue efforts, according to police records. Earlier Tuesday, law enforcement sources told CNN that Alexis recently made contact with two Veterans Administration hospitals for apparent psychological issues. [Updated 12:44 p.m. ET] A gun store in northern Virginia, Sharpshooters Small Arms Range in Lorton, released a statement in response to inquiries about Alexis. For context: An FBI source with firsthand knowledge of the investigation told CNN that one of the weapons Alexis is accused of using was purchased recently at a northern Virginia store. The Sharpshooters statement, shown below, does not affirm that it sold Alexis the gun. "Sharpshooters Small Arms Range has been and continues to fully cooperate with law enforcement authorities in their investigation of the events at the Washington Navy Yard," Sharpshooters said. "In light of the many questions surrounding the event, it is not appropriate to provide any comment at this time, except to affirm that Sharpshooters fully complies with all requirements to conduct background checks on all potential purchasers as required by law, and to further affirm that all purchasers are required to comply with all laws concerning allowed purchases." [Updated 12:06 p.m. ET] The Navy began proceedings in 2010 to give Alexis a "general discharge" from the Navy Reserve because of military and civilian disciplinary issues, but eventually gave him an honorable discharge in January 2011 because of a lack of evidence supporting the sterner measure, a U.S. defense official told CNN's Barbara Starr. The disciplinary issues include at least eight instances of misconduct while on duty, the official said. The attempt to give him a general discharge began after the Navy learned of his 2008 arrest in Georgia (on suspicion of disorderly conduct) and his 2010 arrest in Texas (over an allegation that he fired a gun through the ceiling of his apartment), the official said. Alexis was a full-time Navy reservist from mid-2007 to January 2011. - Arthur Daniels, 51, of Washington, D.C.
[Updated 11:46 a.m. ET] It's back to baseball on Tuesday for the Washington Nationals, who postponed a Monday game as the organization allowed the Navy to use one of their parking lots as a site where Navy Yard evacuees could reunite with their loved ones. The Nationals will wear their "Patriotic Blue" jerseys in the first game of a double-header with the visiting Atlanta Braves, the team said. The first game, to start at 1:05 p.m., is the make-up for Monday's postponement. The Navy Yard is just blocks from Nationals Park. [Updated 11:30 a.m. ET] Secretary of the Navy Ray Mabus on Tuesday will "order reviews of all physical security at all Navy and Marine Corps installations," a U.S. Navy official told CNN's Barbara Starr. "The first will be a quick look to ensure all physical security requirements are being met. The second will be a deeper review to ensure the right physical and personal security requirements are in place," the official said. Earlier, U.S. Rep. Mike Turner, an Ohio Republican and a member of the Armed Forces Committee, said he believed cost-cutting compromised security at the yard, and he wants a congressional briefing from the Pentagon inspector general on a Navy security audit that he says was released after Monday's shooting. "It is my understanding that the IG report indicates the Navy may have implemented an unproven system in order to cut costs," Turner said. "I also learned that potentially numerous felons may have been able to gain restricted access to several military installations across the country due to insufficient background checks, increasing the risk to our military personnel and civilian employees." [Updated 11:21 a.m. ET] Arrests don't automatically prevent people from getting security clearance, says Anita Gorecki-Robbins, a military justice lawyer. Alexis, who had been arrested a few times since 2004, received Department of Defense security clearance so that he could work for The Experts, a subcontractor of HP Enterprise Services that was contracted to "refresh equipment used on the Navy Marine Corps Intranet network," according to a statement released by his employer. Gorecki-Robbins told CNN's Chris Cuomo and Ashleigh Banfield that the Defense Department can decide to give security clearances to people who have been arrested. In Alexis' case, either the arrests weren't picked up in screening, or "someone did see (the arrests) and decided to give it to him anyway." [Updated 10:19 a.m. ET] A former Army attorney says the shooting should raise questions about whether military installations should randomly check vehicles. Alexis entered the Navy Yard because he had a valid military-issued ID and was assigned to work there as a contractor. Greg Rinckey, a former attorney in the Army judge advocate general's office, told CNN's John Berman that the shooting could boost arguments for random vehicle checks, even for people with valid credentials. Authorities have recovered three weapons from the scene of the mass shooting, including a shotgun that investigators believe Alexis brought into the compound, federal law enforcement sources with detailed knowledge of the investigation told CNN on Tuesday. The other two weapons - handguns - may have been taken from guards, the sources say. [Updated 10:09 a.m. ET] To honor the shooting victims, Defense Secretary Chuck Hagel and Joint Chiefs of Staff Chairman Martin Dempsey have just placed a wreath near the "The Lone Sailor" statue at Washington's U.S. Navy Memorial plaza. Other federal officials are marking the shooting, too. Nearly 10 minutes ago, the U.S. Senate observed some moments of silence. [Updated 9:59 a.m. ET] If you're wondering how Alexis could have been honorably discharged from the Navy Reserve in 2011 after a pattern of misconduct, a former Army attorney might have an answer. Greg Rinckey, a former attorney in the Army judge advocate general's office, told CNN's John Berman that a pattern of misconduct doesn't necessarily result in an other-than-honorable discharge - but an honorable discharge might not be Alexis' full story, either. Alexis, who served as a full-time Navy reservist from 2007 to January 2011, was honorably discharged after a "pattern of misconduct," a U.S. defense official with knowledge of the investigation told CNN earlier on condition of anonymity. The official did not detail the misconduct. [Updated 9:17 a.m. ET] Of the eight injured survivors, three were shot - and those three were doing better today at MedStar Washington Hospital Center. A Washington policeman is in fair condition, a female civilian is in fair condition and another female civilian is in good condition. The police officer was shot in his legs. As of Monday night, medical personnel had yet to determine whether he would be able to keep the limbs, CNN's Chris Lawrence reported. [Updated 9:02 a.m. ET] Alexis, the dead gunman, recently made contact with two Veterans Administration hospitals for apparent psychological issues, law enforcement sources said Tuesday. [Updated 8:57 a.m. ET] Alexis was arrested in August 2008 on a charge of disorderly conduct in DeKalb County, Georgia, county police said Tuesday. This is in addition to at least two other arrests, dating back to at least 2004 when he was arrested in Seattle. In that incident, he was accused of shooting out the tires of a man's truck in an anger-fueled "blackout," according to a Seattle Police Department report. In 2010, Alexis was arrested by Fort Worth, Texas, police but never charged over an allegation that he fired a gun through the ceiling of his apartment. According to records, he told police he accidentally fired it while cleaning it. [Updated 8:55 a.m. ET] Authorities have recovered three weapons from the scene of the shooting, federal law enforcement sources said. Investigators believe Alexis brought a shotgun into the compound and may have taken two handguns from guards, the sources said. It is believed that Alexis had rented an AR-15, but returned it before Monday's shooting, the officials said. Investigators have recovered three weapons from the scene, including a shotgun that Alexis is believed to have brought into the compound. The other two weapons - handguns - the sources say, may have been taken from guards. Now, there are reports that an elite team of shooters who could have taken Alexis out arrived quickly out were told to stand down. If true, this displays incompetence in managing, or–much worse–an attempt to minimise a terrible situation for appearances. Not carrying the quickly-arrived-elite-team-standing-down part of the story? I'm not one for conspiracy theories either. However when you have a hypocritical regime touting gun control while feeding arms to al Queda in the middle east (both facts). Then why is it so hard to understand this young man may have in fact was victim to mind control using microwaves. Ah ok @ Jeff Frank and i would never take you for a conspiracy theorist either! Im not as a rule either however only a fool would believe that some conspiracies DONT exist because there are some. And ive also heard of the mind control thing using microwaves. Dont know if its true or not but im sure its possible! And the way things have been becoming public lately i really have little confidence that our government is acting in the best interest of we, the citizens! Time will tell i spose. Right now, the community has 15 submissions available to vote for, but only five of them will be named winners. Janna is a supremely useful assist champion that is a grasp of many trades: pushing, farming, interrupting and safeguarding. League of Legends could be a stand along video game developed by RIOT.